Most of us believe that we could do better or have potential, but never seem to make it, however, coaching allows you to have a “personal trainer” both for your life and work who acts as a confidential sounding board and keeps you accountable to your goals and your growth. 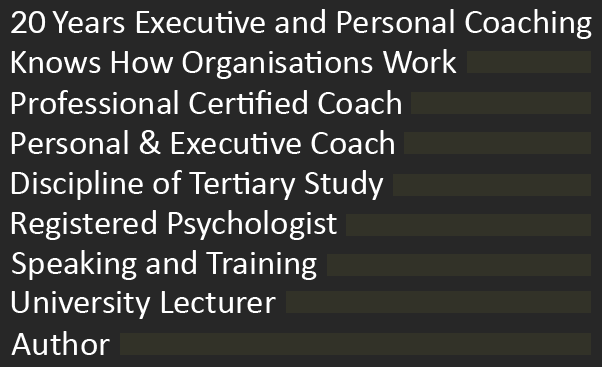 Many organisations struggle to develop sound leadership skills from within, however, expertise in clinical and organisational psychology along with credentialed coach training means that it is possible to grow and develop individuals and at the same time creating a positive culture. Many people know what they DON’T want to do in a career, but they have little or no idea what they DO want to do. However, it is about playing to your strengths and talents. In other words, a job needs to be an extension of who you are. Some families entrench themselves into corners, egos rule the day, and when they are all in crisis, they call in the “Rehabilitative” Coach; other families see the issues coming long before they arrive and call in the “Preventative” Coach. Why would anyone want to be led by you? The very first person that you lead is yourself. So, if you wouldn’t follow yourself, why would anyone else want to? Coaches assist in providing self-awareness & act as a confidential sounding board to grow you as a leader. Any business is hard work no matter whether it is a start-up or a well established business and it’s critical to be across the 3 pillars of business; the money (in and out), the marketing (of the service or product) & yes, the staff. Coaches assist in all these areas. What does a psychologist learn over more than 30 years of work with individuals, parents, families and businesses? Dr Cross has written on a variety of topics in very practical ways about dealing with children, adolescence, depression in the workplace, the art of listening, self-sabotage and discovering success and happiness. These books are available in audio, Kindle or hardcover. - How can I get job satisfaction? - How can I get a promotion? - How can I find out what I really want to do? - How can I find a job? - How can I change career direction? - How can I make a contribution? - How can I find purpose? - Where to from here? - What course should I study? - Should I enrol in a post-graduate course? - How can I get motivated? - How can I enjoy my job? - How can I get ahead? - What subjects do I choose at school? - What is my career path? - What are my strengths and talents? - Where am I headed? - What do I do after secondary school? - Should I go to Uni or TAFE? - Should I have a "Gap Year"?